ALKALINITY MINUS is used to reduce the total alkalinity and pH levels in pool water. Balanced total alkalinity and pH are the keys to have balanced pool water making it easier to sanitize and obtain safe water. ALKALINITY MINUS is an Ecologo certified solution of organic acid specially developed for pool water treatment. Do not mix with any other chemical. Do not swallow. Do not get in eyes, skin or clothing. Do not breathe fumes. Handle with care. Keep out of reach of children. Wear gloves and safety glasses. Use only in a well-ventilated area. Keep container closed and store in a cool location. Contains: organic acid. If swallowed, call a Poison Control Centre or doctor immediately. Do not induce vomiting. If in eyes, rinse with water for 20 minutes. If on skin, rinse well with water. If on clothes, remove clothes. If breathed in, move person to fresh air. 1. Use 250 mL of ALKALINITY MINUS per 10,000 L of pool water to lower pH by 0.1. 2. Pour required amount of product directly at the water outlet. 3. Test pH after 24 hours. 1. Use 250 mL of ALKALINITY MINUS per 10,000 L of pool water to reduce total alkalinity by 10 ppm. 2. Pour required amount of product directly into deep water columns. 3. Test total alkalinity after 24 hours. INCREASES pH in Swimming Pool Water. Sprinkle pH+ on surface of water. Let water circulate for 4 hours after adding product, then check pH. Make necessary adjustments. NOTE: Never add product when bathers are using the pool. To achieve maximum sanitizer efficiency and to avoid corrosion of surfaces, your water's pH should be between 7.2 and 7.8. 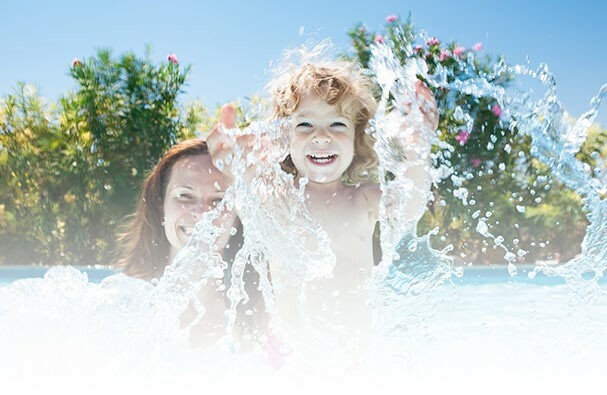 Maintaining a balanced pH will insure better bather’s comfort and protect pool equipment. DECREASES HIGH ALKALINITY AND pH LEVELS in Swimming Pool Water. Sprinkle pH MINUS on surface of pool water. Let water circulate for 4 hours after adding the product, then check pH. Make necessary adjustments. To achieve maximum sanitizer efficiency and to avoid cloudy water and scaling, pH of pool water should be between 7.2 and 7.8. Prevents chlorine loss due to ultraviolet rays. 2. Protect residual chlorine from being destroyed by the sun's rays by adding 300 g of STABILIZER per 10,000 L of pool water slowly in the skimmer in order to reach an initial level of 30 ppm. 3. To adjust the stabilizer level, keep in mind that 10 g of STABILIZER per 10,000 L of pool water will increase the stabilizer level by 1 ppm. TREATMENT TO INCREASE WATER HARDNESS for Swimming Pool Water. To achieve maximum balance of pool water and to avoid erosion of surfaces, your pool water's total calcium hardness should be between 200 and 300 ppm. Maintaining a balanced calcium hardness will insure better bather’s comfort and protect pool equipment. 1. Check total calcium hardness using a testing kit. The ideal recommended level is 200 to 300 ppm. 2. To increase total calcium hardness by 10 ppm, dissolve in a bucket of water 130 g of CALCIUM PLUS per 10,000 L of pool water. Add to the pool. 3. Check calcium hardness levels regularly and make necessary adjustments. CONTROLS pH FLUCTUATION in Swimming Pool Water. 1. Check total alkalinity using a testing kit. The ideal recommended level is 80 to 120 ppm for chlorine pools and 100 to 150 ppm for bromine pools. 2. To increase total alkalinity by 10 ppm, dissolve in a bucket of water 168 g of ALKALINITY PLUS per 10,000 L of pool water. Add to the pool. 3. Check alkalinity levels regularly and make necessary adjustments. To achieve maximum sanitizer efficiency and avoid pH variations, your pool water's total alkalinity should be balanced. Maintaining a balanced alkalinity will insure better bather’s comfort and protect pool equipment.